The King of Rock and Roll moved to the circular abode with Priscilla Presley after their Las Vegas wedding in 1967. 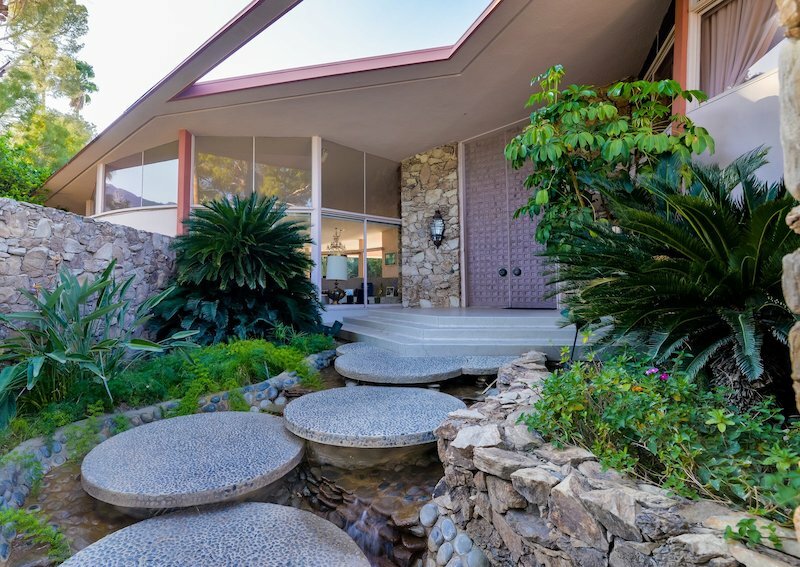 Named “The House of Tomorrow” by Look Magazine in 1962, 1350 Ladera Circle got its second brush with fame when Elvis and Priscilla Presley, just married, signed a one-year lease in 1966. The couple used the spacious, five-bedroom, five-bath midcentury home as their honeymoon pad in Palm Springs, California, renting it for $21,000. Today, the home asks $5,900,000. Designed by architect William Krisel, the saucer-like abode looks futuristic even by today’s standards. Four circular living areas are stacked across three levels with walls of glass looking out over the pool terrace. The round motif continues with curved stone walls, a free-standing fireplace in the living room, and a circular kitchen island. The 5,000-square-foot residence rests on 1.16 acres and includes a private garden, tennis court, and orchard. For Elvis fans, this property is a great piece of rock ‘n roll real estate. 8150 Gannon, University City, MO The Video!